Prior to choosing the appropriate formula, you simply break the angle into either the sum or the difference of two angles from the unit circle. Refer to the unit circle and notice the angles in radians in the figure. You see that all the denominators are different, which makes adding and subtracting them a nightmare. You must find a common denominator so that adding and subtracting is a dream. The common denominator is 12, as you can see in the figure. This figure comes in handy only for sum and difference formulas, because finding a common denominator is something you do only when you’re adding or subtracting fractions. Rewrite the angle in question, using the special angles in radians with common denominators. From the figure, you want a way to add or subtract two angles so that, in the end, you get pi/12. Because you rewrote the angle with subtraction, you need to use the difference formula. Plug the information you know into the chosen formula. Reduce the fractions in the formula to ones you’re more comfortable with. 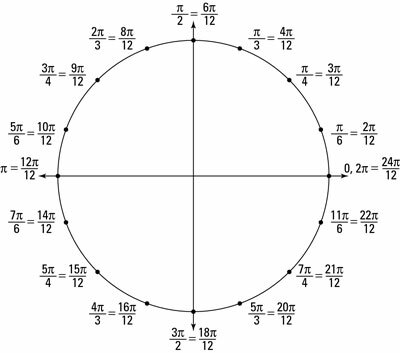 Now you’ll have an easier time referring to the unit circle to get your equation. Multiply and simplify to get your final answer.